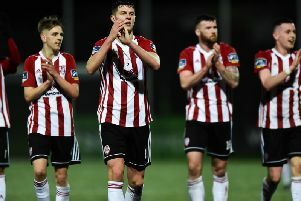 Derry City defender Ally Gilchrist has been voted the club's star performer during the opening round of league fixtures. 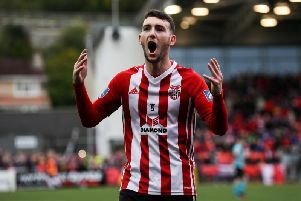 DERRY City fans have voted defender, Ally Gilchrist as the club's star performer during the opening round of SSE Airtricity Premier Division fixtures. The former Shamrock Rovers centre half has played in seven of the eight league matches so far this season. Showing his versatility, the Scotsman has also played at left-back against Dundalk and has helped his side to two clean sheets during those fixtures. Gilchrist secured 37.6% of the Journal's online poll this week, narrowly pipping midfielder, Ciaron Harkin who received 36.3% of the total votes. Eoin Toal 5.1%; David Parkhouse 10.3%; Ally Gilchrist 37.6%; Other 9%.